The Vello 67mm Snap-on Tulip Lens Hood (Version II) is designed to fit lenses with a 67mm filter thread. The hood is designed for use with internal focus type zoom lenses. When used with "full frame" sensor cameras, the starting focal length should be above 20mm. With "APS-C" sensor cameras, the starting focal length should be above 15mm. With wider lenses, especially on full frame cameras, some slight vignetting might occur. The "petal" shape of this lens hood maximizes the amount of hood coverage with the minimum amount of weight and hood area. In addition, the design of this hood allows it to be reversed and stored on the lens, when not in use. It is also designed to accept lens caps. Lens hoods are primarily designed to prevent unwanted stray light from entering the lens, by extending and shading the end of the lens. In addition, since the end of the lens is extended, you also get the added benefit of some extra protection from accidental impact. Box Dimensions (LxWxH) 4.6 x 4.5 x 2.4"
67mm Snap-on Tulip Lens Hood (Version II) is rated 3.6 out of 5 by 17. Rated 5 out of 5 by Pericles from Works great for my Nikon Coolpix P900 This fits my P900 great with no vignetting. It also also the lens cap to be put on while on the camera. Rated 4 out of 5 by Mark from for Canon SX40 with 67mm filter adapter Wanted hood to use with 67mm filters on Canon SX40. A bit bigger than I expected but works good without vignette even when lens zoomed in to 24mm and two filters stacked on lens. Did not seat fully on Tiffen filters due to slim filter design. Sanded off first thread on hood clip to get a better fit. Still seems to hold on good. Needs some effort to push in clip to attach but suppose necessary to assure a good hold. Rated 4 out of 5 by sc photos from Works great if a lens cover is not used. After an extended search for a lens hood to fit and Olympus 14-54mm f2.8-3.5 II with help from B&H Photo and Olympus, this hood was found. It fits the Olympus II lens with or without a UV filter in place, however, this hood will not fit on the lens when a lens cover is in place as did the original Olympus hood. As a result, if the lens cover is on the lens for protection, this hood must be carried separately and put on the lens after the cover is removed. B&H went the extra mile to help. Rated 2 out of 5 by Photo Bummed from Not So Much... I bought this for my Canon 18-135 mm lens. Does it fit, well sort of. Will it flip and store in reverse, again, well sort of. I'm not impressed with how it attaches, looks or feels. I think if I bump it it will fall off and I expect it to be stripped very soon. In my opinion, I'd pay more to have a better choice. I would prefer a longer hood, don't really prefer a tulip shape, barrel shape would be great, just couldn't find anything like that for Canon 67mm lens. Anyone have a good suggestion of another choice? Rated 4 out of 5 by Mowawk Badger from Works well but can be hard to attach. I have used the Velio hood on my 18-140 Nikon Zoom in mixed sunshine and find that it works as well as the dedicated hoods that come with some of my other lenses. My only issue is that it can be hard to secure to the filter ring. If I am carrying it reversed on the lens or in my bag and need to make quick shot it can take overly long. Otherwise it does its job well. Rated 4 out of 5 by Spencer from Snaps on fine. Snaps on without a problem. Tells you on the tulip what is the top. You will notice if you try to go wide with your lens, you see part of the hood in your shot.Just rotate your hood until you dont see it your lens. Did not give it a five star because it is hard to snap on your lens cover with this tulip hood. Rated 5 out of 5 by Editman from Lost my Hood on a shoot! I lost my Sony Lens Hood off my FS700 kit lens on a shoot in Alaska. No way to go back and look for it in the Tundra. So I searched for a replacement....and for the money, quality, and reggedness. You cant beat this one! I'm using a stepping ring for a 67mm filter on a 52mm lens. 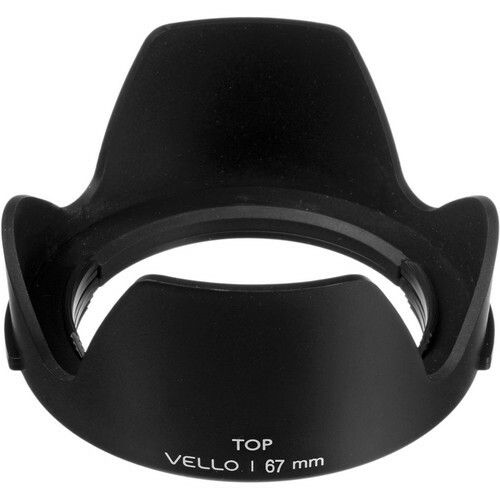 Will the 67mm snap-on tulip lens hood snap onto the 67mm filter so that I can use it with my 52mm lens? I would like to use all my 67mm filters on my 52mm lens, but really miss having a lens hood. If this lens hood won't work, can you recommend another one that would work under these circumstances? Yes, this lens hood will connect to your 67mm filter providing that the filter/filters you that have have a threading on the front so as to connect other filters/caps etc. This lens hood mounts in the same fashion as a lens cap. Would this hood work on the Sony 24 to 70 F4 lens? Purchased one used and it didn't have the hood with it. Seems like it should, but on our Nikkor lens it didn't fit reversed so it was less convenient than the OEM hood.